Lately it feels like I’ve been smashing my head against a brick wall. Despite a load of field trips, my good intentions to get down to it and draw something GOOD are getting me nowhere. I’ve dragged myself up mountains only to find my hand can’t translate the views. 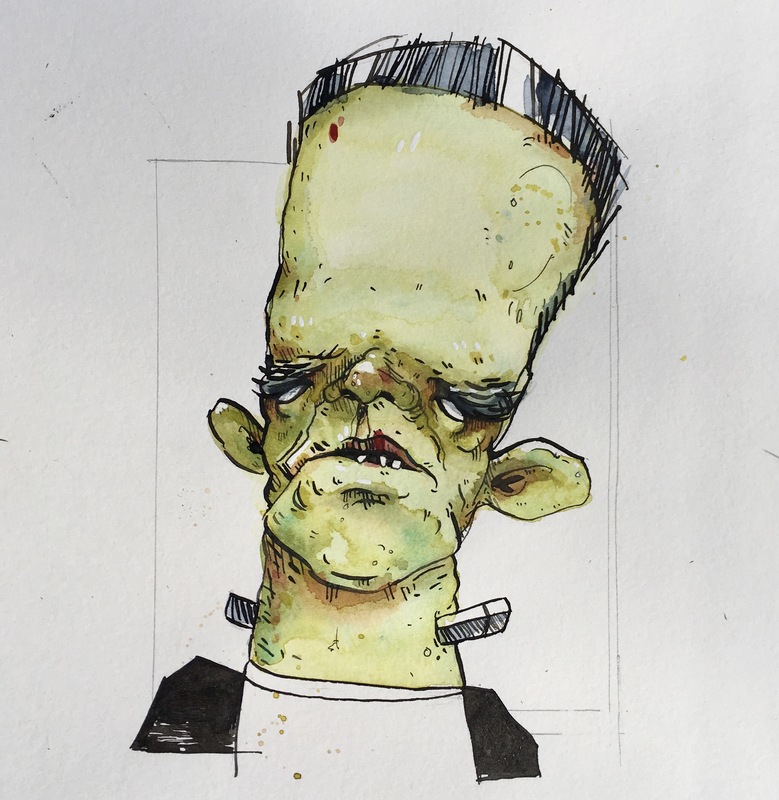 I’ve sat in cafes and ruined perfectly good coffees by taking too long scribbling away on an overworked sketch. Things just don’t work. Sometimes I’m able to just keep battling away and eventually the great art gods will bathe me in their magnificent glow and bestow upon me the ability to create a passable painting, but not lately. So what do you do when you just can’t seem to get it right? Thinking back, I’ve spent the last few months worrying myself sick over perspective in buildings. I’ve watched videos, read books, and pushed myself further and further with each drawing. Until the Brighton Pavilion. I got two lines into the drawing before snapping the sketchbook shut. Usually a building like that would have me super excited about the details and curves I could lose myself in, but no. Instead I felt sick. I was putting too much pressure on myself to figure out how each little section of that building was constructed, I needed a break. Skip forward a few days and you’ll find me sprawled in bed, scribbling away on the iPad. I adore the iPad for this. I don’t have to worry about ruining sketchbook pages because handy digital just lets me delete the bad stuff, and as if by magic my hand is loose and free and able to doodle away without fear. I start by making wonky shapes, then chuck on some tiny eyes, add some details, make some tea and suddenly I’ve created something. I adore this weird little guy. I however fully understand how you might not. It’s not my usual sort of thing, and who knows what the “proper art” crowd would make of it. But he’s mine. And I love him so much more than those two lines I drew at the Pavilion. And remember, the point was to let myself TRY SOMETHING DIFFERENT, not to judge myself for doing so. 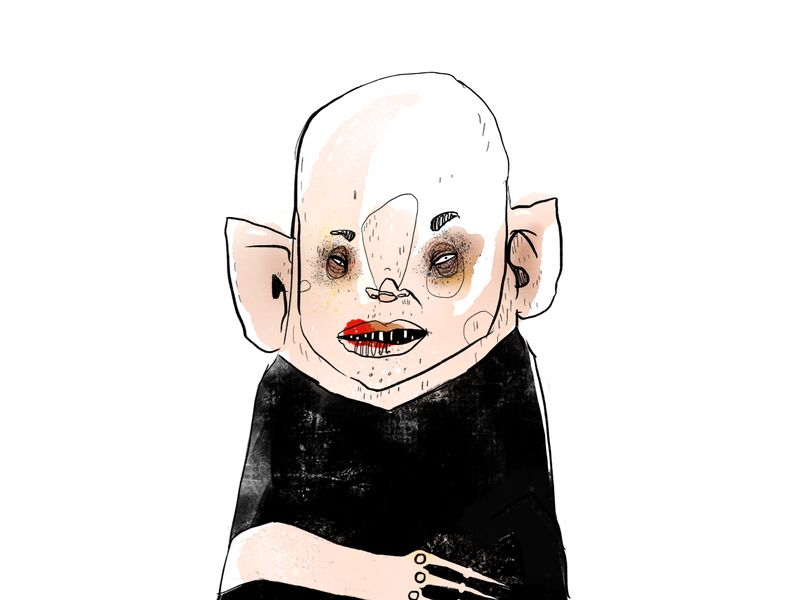 So without further ado, let me introduce you to Nosferatu. Isn’t he adorable? And although he isn’t exactly my most finished piece he’s started something. 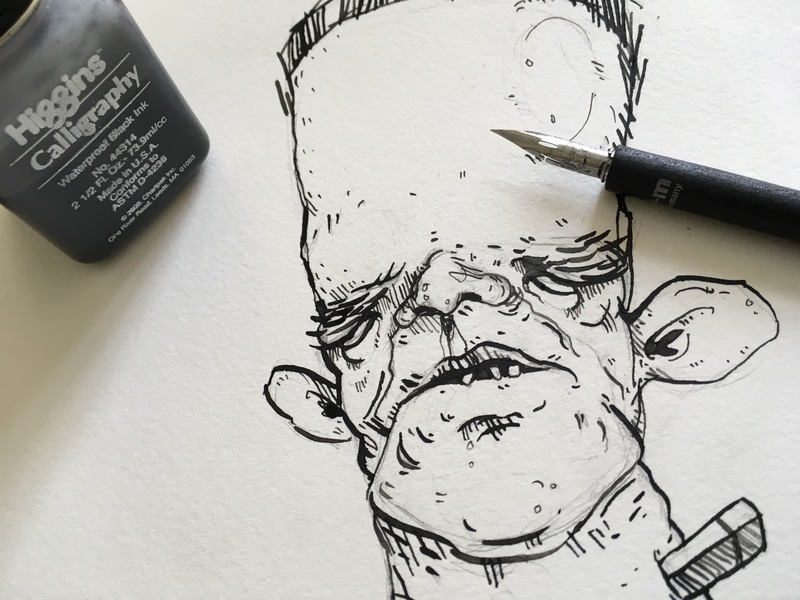 Today, inspired by that creep, I pushed it a little further… and what’s more classic a monster than Frankenstein’s monster? 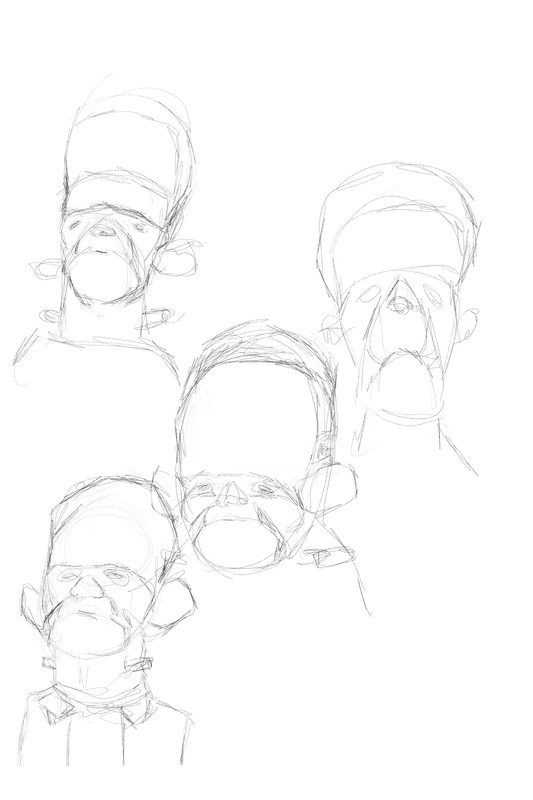 I started by doodling a few different options for the head, and already I’m super chuffed with myself. A few days before I would have been holding a pencil in front of my eye, tongue sticking out, measuring the exact proportions of a big silly building that I don’t even really want to draw. Instead I find myself actually HAVING FUN. God forbid. I continue developing the drawing until I’m ready to put actual pen to actual paper. Slipping briefly back into my “BUT MY HAND CANT MAKE ART ANYMORE” panic, I take a few deep breathes and remind myself that this is just for me, it’s meant to be fun, I’m letting myself play. And boy am I glad I did, look at this guy! I love his wonky lines and dodgy proportions, and I loooove that I didn’t have to mess about measuring and worrying and silently judging myself while I did it. Sometimes you need a fresh start. Get far away from your “usual thing”. Scribble something embarrassing. Try a ridiculous idea. LET YOURSELF PLAY. Draw your dog with stupid facial expressions. Photoshop tiny bears into all your Facebook photos. Maybe, like me, you’ve put too much pressure on yourself and don’t even realise it, and need something to snap you out of the rut you’ve created for yourself. Stop taking yourself so seriously, take a deep breathe, and remember why you started drawing in the first place. I bet when you were a kid you weren’t thinking “I’m gonna grow up to be an artist so I can perfectly render the proportions of Brighton Pavilion”. No. You just loved scribbling on things. Go do it again.